Sharp has expanded its business line with a new cloud-based media service business which is named as “GALAPAGOS”. The e-bookstore service is the first service to be available in GALAPAGOS which featuring an “Automatic Scheduled Delivery Service” (fee-based service) for periodical publications which includes newspapers and magazines. 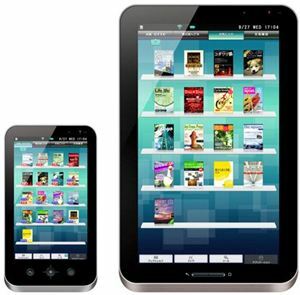 In effort to support the new e-bookstore service, Sharp has also developed two Android based e-book readers which are mobile type and home type. Mobile Type is the smaller size eBook reader which featuring 5.5-inch LCD display with 1024 x 600 resolutions that reads like a paperback book. It is available in red and black, and comes with a trackball to scroll through pages. While the home type is featured with a 10.8-inch inch high-resolution HD LCD display with 1366 x 800 for allows users to enjoy magazines formatted across a two-page spread. In addition, both e-book readers are also support Wi-Fi (IEEE 802.11b/g) connectivity. The Galapagos e-bookstore service is scheduled to be available in Japan in December with approximately 30,000 newspapers, magazines and books. However, the prices for the two e-book readers are not yet announced.